Let me have this. I have a soft spot for Mandy Moore. It all began one warm summer afternoon when I saw the video for Crush. She bit her knee. Yes, she literally bit her knee. And for some reason, I was smitten. Then she released Coverage, an album full of some choice covers. I was quite impressed, and it was quite cool that she worked with the likes of John "Strawberry" Fields and Andy Sturmer. And it gave me hope that she was something above and beyond the other blondies in the pop music world. She kinda has a cool voice that has a personality all its own. She even went brunette, which was pretty gutsy. Now she's working with the likes of Adam Duritz and Chantal Kreviazuk for her new album. I realize Duritz of Counting Crows really hasn't done anything great since that first album, but what a great album! Sullivan Street?! Damn, gimme my iPod now. But Michelle Branch?!!? Mandy, you're slumming. Come on, we all have our guilty pleasures. My god, "as fragile as sugar paper?!" That is way lame. But Snow Patrol's Final Straw has been a nice guilty pleasure for me over the past year or so. I don't know why I feel guilty about it. But I do. I'm sorry. Run ... cool tune. I don't care about live albums. I don't care about benefits. New studio albums, though, catch my attention. Wilco in 2006. After big shows earlier this year from Tom Petty and Green Day, Paul McCartney stopped by the new Iowa Events Center last night for an intimate and modest performance, which was neither intimate nor modest. Bad beer. Bud Light? At least Tom Petty had Sam Adams. Too many guitar lifts following a song. It started to look like he just wanted some exercise. The lack of cheesy-yet-necessary lighters: no smokers in Des Moines anymore? Let It Be was sadly not illuminated enough. It had to end at some point. A real bummer. The quality of musicianship. McCartney is underappreciated for his skills on guitar, piano, and especially bass. As a bassist, he truly deserves a spot at the top. The choice of bandmates. The guitarists were so skilled it was almost embarrassing. And the drummer - damn. The stage. Video screens made up the floor and backdrop for a very cool submersive effect. The large video screen (for us in the nosebleeds) was crisp and colorful and as high-def as you could need. And the pyrotechnics were kept to a minimum for maximum effect (Live and Let Die was sweet, and his new one Follow Me had some nice cascading sparks near the end of the tune). The music, obviously. It's timeless and life-affirming and just plain fun. He delivers. He's a showman and he knows what the crowd wants. The crowd wants to see the Beatles classics live: Let It Be, Yesterday, Hey Jude (with the predictable yet necessary and enjoyable sing-along: who doesn't want to sing with Paul?! ), Sgt. Pepper's, Back in the USSR, Eleanor Rigby, Penny Lane, I Will, and on and on and on. They want to see his best solo hits like Maybe I'm Amazed, Band on the Run, Jet, Let Me Roll It, etc. He's a master at creating a mood and sticking with it while seemlessly transitioning from ballads to anthems to rockers. The DJ who opened the show (spinning bits and pieces of McCartney's ridiculously expansive library of tunes to great effect) was not necessarily expected, but definitely added a nice modern touch to the evening. It'd be great to find this somewhere online. His new tunes, particularly Follow Me and Jenny Wren (the new single), stood up incredibly well with the classics. It seems Sir Paul really got it right with this new album. I had some revelatory moments with old tunes that never really moved me much before last night. Blackbird, in particular, was quite possibly the highlight of the night for me and I would have never expected that. The tune is universal and transcedent and something I'll never listen to in the same way again. Similarly, Eleanor Rigby far exceeded my expectations as a live tune. Amazing. The man is 63 and barely seems 40. He played for nearly 3 hours and hardly broke a sweat. It'd be one thing if he spent the whole time sitting at the piano, but he only did that for a few tunes. He was up-front keeping up with his much younger bandmates without any problem. True, his voice cracked at times and he can't belt out Helter Skelter like he could on the studio version, but this only added organic authenticity to the songs and his persona. The show may have been over-scripted, but it never really felt that way because of that. I could go on and on, and probably will in person if you ask. For now, though, I will revel in my post-show glow and simply let it be. Guster has some news. Guster is playing live shows. Guster is not playing Des Moines. Guster is releasing new music. Guster is my friend. Me gusta Guster. Hey happy readers - it's been quite awhile since the ol' Bonj had words for you. The Mates of State gig at ISU's Memorial WhatEver MShop Thing back in late September was a blast. Kori and Jason played louder than any two people I've ever seen, and the grroovvee was insane. Who knew an all-ages show still meant us a-dolts could get wrecked on decent beer? Lots of very pretty girlies, but knowing they're all about 10 years younger than me is a) depressing; b) daunting; c) funny when one is wrecked on decent beer. Also picked up some newer things...Wolf Parade's Apologies to the Queen Mary is currently in Bonji's Heavy Rotation. If you haven't checked it out, DO IT NOW. Part of me says it's very much what U2 would sound like today if they would have held onto the Fire and not gone adult smarmy. Saw a few cool bands to dig on Subterranean recently. Can't remember any of them, but I did TIVO the show. I'll be back with names. Loves to everyone! Ben Folds takes the inevitable aging-pop-star step of releasing a live recording with backing by a full-fledged orchestra. It probably sounds kinda pretty and stuff. What next, an opera about One Angry Dwarf or something? I have yet to really get into podcasting. My commute is too short. But news that Liz Phair is podcasting while on the road helps me see the potential that this new medium really has. Although, I don't know if I have enough patience to hear Phair read her original fiction. Maybe it's good, who knows, but I don't want to waste precious iPod time on mere words without music. Hmm, don't tell me she's going to release a book of poetry next, ala Jewel. Gack. Oh god, maybe Jewel will start podcasting ... we've gone down a bad road here, folks. TMBG, Dramarama, Dead Can Dance, Ash: what the hell, is this 1990?!? Read "La La" as "throw a hard object at your head." The lesser of the Simpson girls (and that's saying a lot) debuts at number one on the Billboard charts, beating out new ones from Depeche Mode and others. Bad yikes. Before Live 8 and Live Aid and Farm Aid and other aids was The Concert for Bangladesh spearheaded by George Harrison. Revisit it next week on DVD and CD. Stereogum and others has provided yet another excellent tip: unreleased Elliott Smith tunes that have leaked. Find them all here. 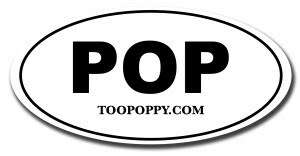 Sigh, too poppy, playing catch-up again. Vacation will do that to you. Paul McCartney has opened a store to sell merchandise from his current tour. $35 for a t-shirt? Jumping Jehosephat! Related: PM in DM in one week! Sabbath, Blue's Clues, Flaming Lips ... frankly, it just makes sense. Pick a band, any band, and it will map out other bands within the interests, style and other criteria. The size of the halo around the artist shows its popularity. A really interesting way to discover new bands. Oh yeah, they also do movies. Despite being a Commodore fan back in the day, this seems a bit sad and pathetic. Looks familiar, eh? Thanks to Stereogum for the lead on this. Are You a Fool, or Is It True? In yet another stellar attempt to honor the memory of her late husband on what would have been his 65th birthday, Yoko Ono takes a cheap shot at Paul McCartney at the Q awards. Related: I was quite surprised to see Oasis pick up a couple big awards. Don't Believe the Truth is a decent return to form for them, though, so it's good to see them recognized for it. Yesterday would have been John Lennon's 65th birthday. It's been 25 years since he was shot and killed in New York. To commemorate the occasion, Yoko and Capitol has found a way to compile his previously released material into a whole new release. Giving us little reason to purchase a compilation of music we already own sounds like a great way to honor Lennon's memory and contributions. Well, I suppose it's been "mastered from the most up-to-date sources." If anything, the signed birthday card is worth a look. New Radiohead album reminds Yorke of Kid A. Too bad. I much prefer OK Computer or Bends, but I think I'm in the minority there. A sweet Teenage Fanclub cover by Splitsville, featuring former members of Greenberry Woods. Check out more from Splitsville via iTunes. Not a huge fan of tribute CDs, but this is bound to be one of the better ones: Elliott Smith. Seems the curse of Badfinger continues. New Mike Viola. Feels good.